Julie and Rod Calder Potts at Highbank Orchards have been quietly, determinedly ahead of the curve for a long time. Rod’s parents were the first to grow hops in Ireland, and, after beginning apple production at their Co. Kilkenny farm in 1963, Rod and his wife Julie made the decision to switch to organic farming methods some 20 years ago. They’ve been hosting forward-thinking ‘Bia Beag’ meet-ups in their stone outhouses on their farm for several years, they’ve launched a 0% alcohol ‘Driver’s Cider’ and they now have an Organic Orchard Spirit in the works. 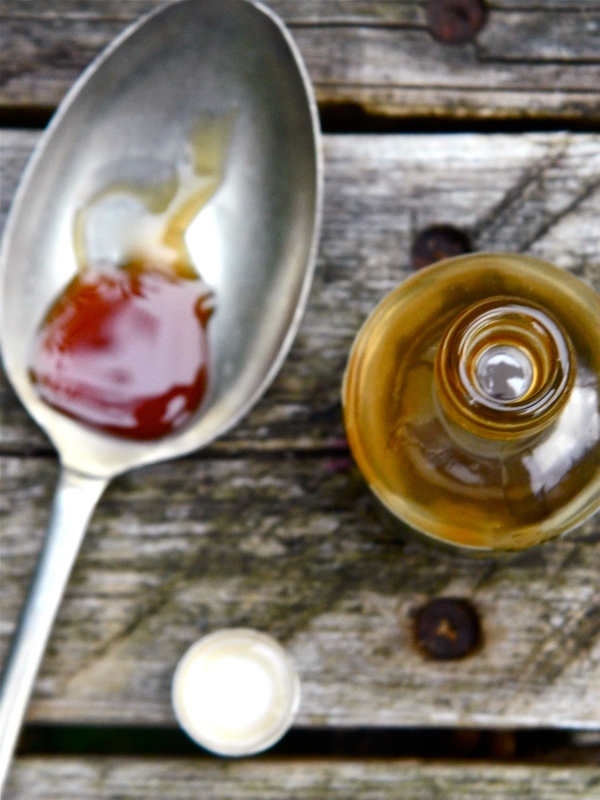 They’ve also struck on (liquid) gold with their Orchard Syrup product, which has been described as ‘Ireland’s answer to maple syrup’, but really is more than that. It has the same texture as maple syrup, and you can certainly use it in similar ways, but it has a more complex, layered taste; a beautifully rich apple flavour that can do more than just sweeten things, with a faint toffee apple taste and a cidery tang. It enlivens, it teases; it tastes new and exciting, and although it’s four years old, there’s nothing else quite like it on the market. The syrup, which is essentially a highly concentrated apple extract made from cider apples, came about as a happy accident, according to its maker, Julie. The story goes that she was experimenting with a pot of apples on the stove, having remembered an apple reduction that her husband used to sell to poitín makers at the farm gate in the 70s. 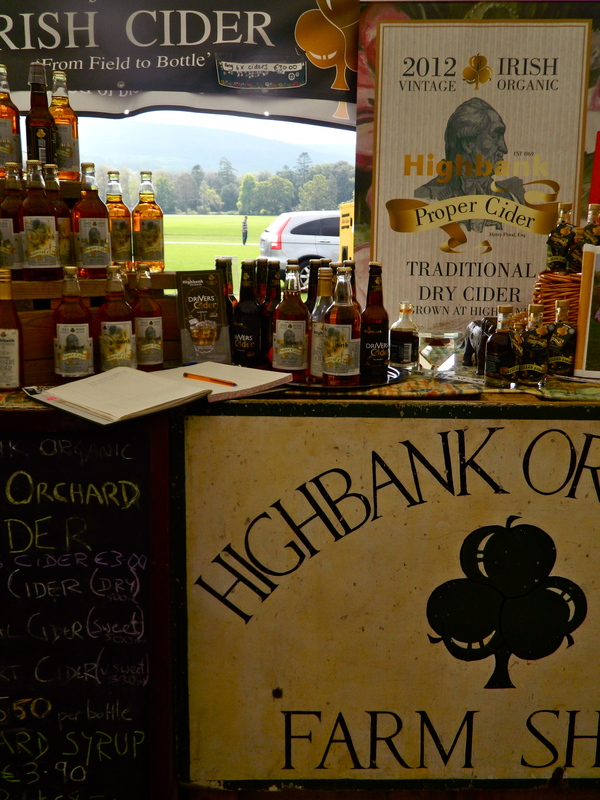 The phone rang, the apples cooked on – and Highbank Orchard Syrup was born. Listening to Julie speaking about her family’s orchards several weeks ago, I was struck by how much knowledge she and her husband had about apple production, and particularly within the area of organic husbandry. 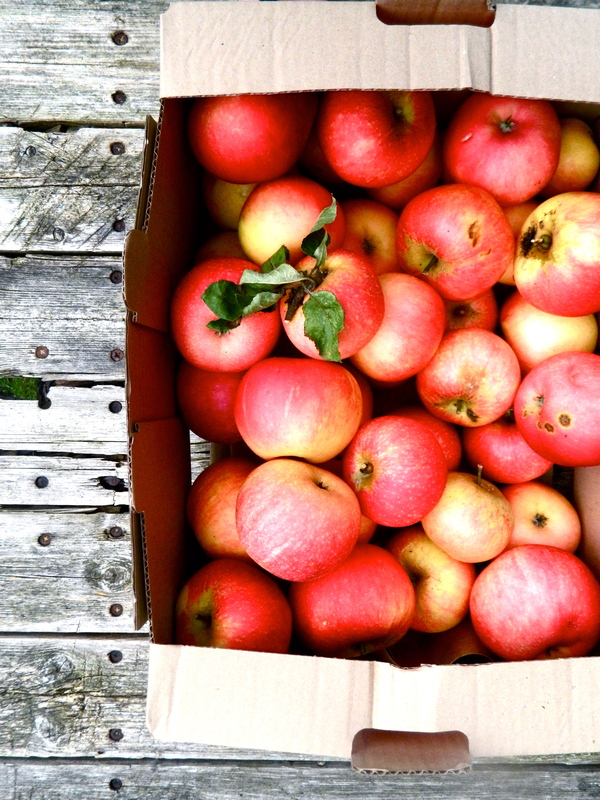 The Calder-Potts don’t use any herbicides, GMOs or chemical fertilizers on their trees, and warn against buying commercial varieties, as apples ‘absorb pretty much everything you spray on them’, according to Julie. Washing them doesn’t help, apparently. They use liquid seaweed as a fertiliser, and are considering spreading their apple pulp, which is a remnant of cider-making, on their soil. They’ve also engaged in an interesting collaboration with Cork-based master bakery Arbutus, which may see a by-product from cider production being used as a natural yeast in a range of special breads, baked by Declan Ryan and his team in Cork. 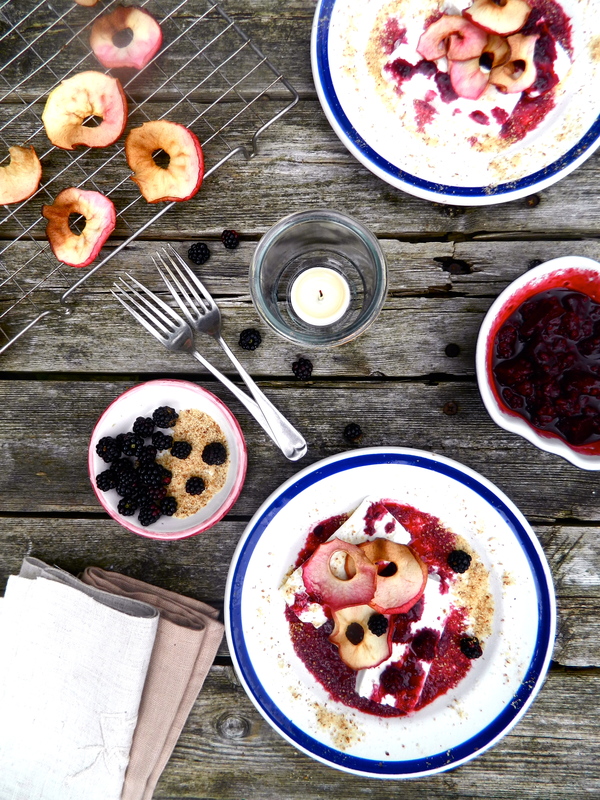 Clodagh McKenna serves Orchard Syrup on French toast in her restaurant in Blackrock, Donal Skehan serves it with buttermilk hotcakes, and Imen McDonnell pours it over her baked cinnamon porridge. There’s lots of options for it beyond the breakfast table too, however: try it drizzled over a zingy shaved apple and burrata salad for an autumn lunch, for example, or swirled into a cosy vanilla and cinnamon rice pudding for dessert. I used a little in an apple and blackberry sauce, which we had with apple crisps (made with slices of our lovely pink-streaked Discovery apples from our old apple tree), hazelnut powder, and good old-fashioned vanilla brick ice cream. 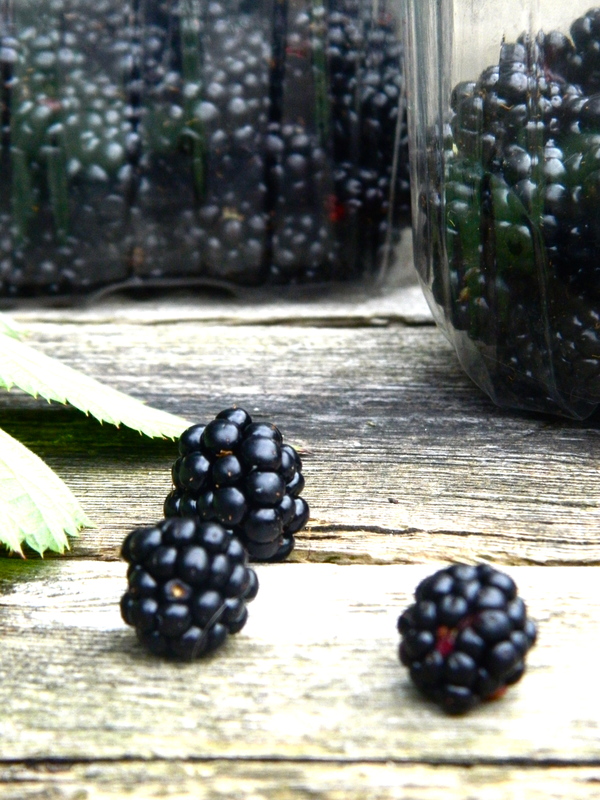 Check the blackberries for any remaining stems or leaves. 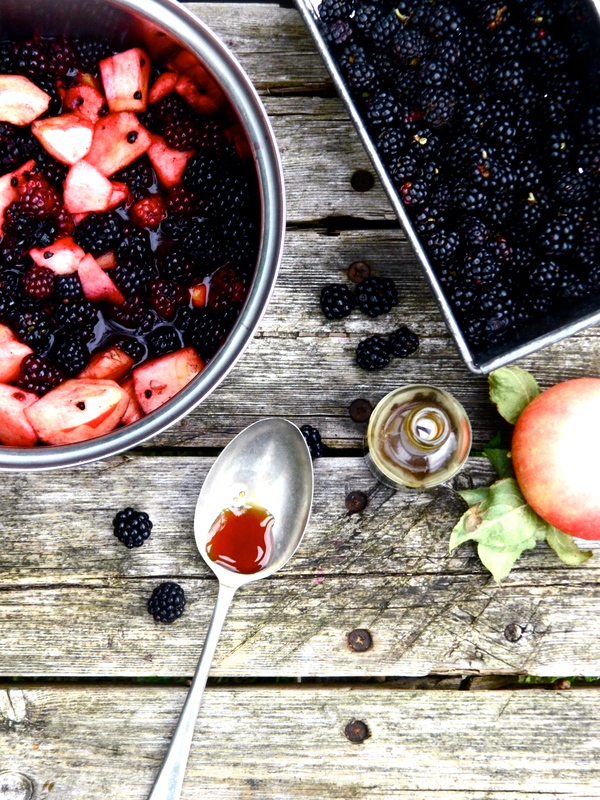 Mix the blackberries, diced apples, syrup, vanilla and water together in a saucepan and simmer over a medium heat for about ten minutes, or until the apple has broken down and the blackberries are soft and yielding. If the blackberries are sour, add the sugar and cook on for a few more minutes. To make the apple crisps, simply slice the apples as thinly as you possibly can, lay on a parchment-lined tin and bake slowly in a medium-hot oven for about 20 minutes, or until they don’t feel damp to the touch. If you have any leftover apple crisps, mix with some blackberries, oats, chopped apple and yoghurt and a little Orchard Syrup. Leave it in the fridge overnight to make Bircher muesli or ‘Overnight Oats©’ (if you’re that way inclined) for the morning.